Long noncoding RNAs (lncRNAs) play important roles in regulating various biological processes including growth and stress responses in plants. RNA-seq data sets provide a good resource to exploring the noncoding transcriptome and studying their comprehensive interactions with the coding transcriptome. 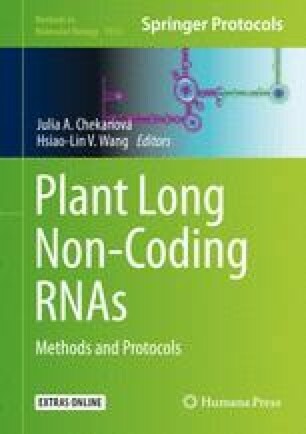 Here, we describe computational procedures for studying plant lncRNAs including long intergenic noncoding RNAs (lincRNAs) and long noncoding natural antisense transcripts (lncNATs). Bioinformatics tools for transcriptome assembly, lncRNA identification, and functional interpretations are included. Finally, we also introduce PLncDB, a user-friendly database that provides comprehensive information of plant lncRNAs for researchers to compare their own data sets to those in public database. We thank Jun Liu and Huan Wang for developing the above bioinformatics methods for lincRNA and lncNAT analyses and Jingjing Jin for constructing PLncDB. This work was funded in part by Singapore NRF RSSS Grant NRF-RSSS-002.